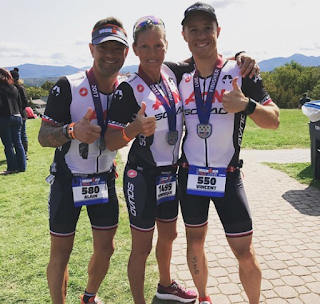 Your Infinit Story: I started using Custom infinit nutrition in January 2015, I was training for Ironman Mont-Tremblant and I wanted my nutrition to be simple and stress free. 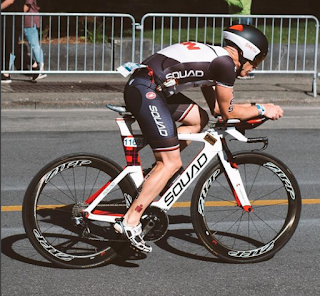 I wanted to be able to concentrate on my racing rather than remembering to take this type of gel every 30min, that nutrition bar every other time and doing the calculation of how much of each I would need to bring and how to carry them on the bike and run. Infinit nutrition was the answer, an all-in-one drink that covers all my nutritional need. After a consultation with Darcy, we quickly came up with my personal formula for endurance events. I immediately started using Infinit in my training and I loved the simplicity, two scoop per bottle, one bottle every hour. That was easy to remember and it worked. The first real test came in during IRONMAN Mont-Tremblant 70.3 2016.That year we raced in very hot weather, a sunny 30 celcius day with a real feel of about 38 Celsius. During the bike and run I didn’t really think about, I just kept my strategy to drink about 1 bottle every hour and I was feeling good. But after the race, I saw how many people were dehydrated, some were forced to abandon, others spent hours in the medical centre! At that moment I realized how well I was hydrated and fuelled; that is how good Infinit Nutrition is. From that moment onward I was hooked and used my personal long distance formula for every race, event and training session including Ironman Mont-Tremblant, several 70.3 and Olympic distance triathlon, Grand Fondo, road races and long trail runs.